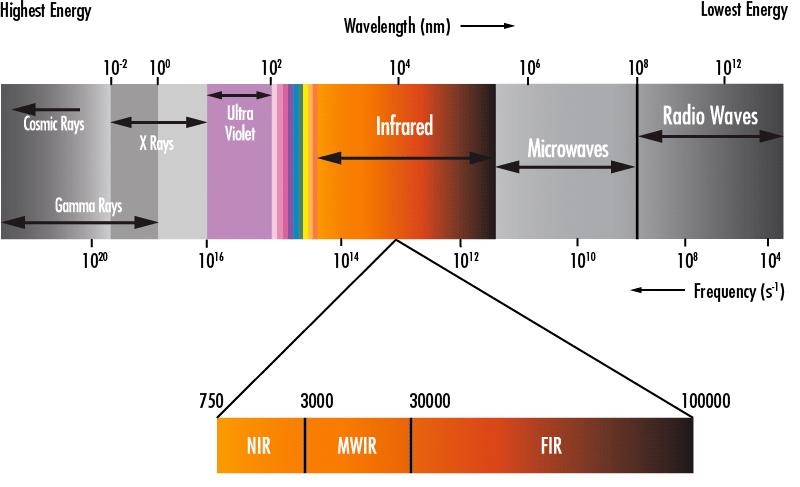 The realm of infrared electromagnetic wavelengths begins close to the red visible light and continues from 750 nanometers up to 1000,000 nanometers within the deep infrared segment, also known as FIR or heat seeking cameras for law enforcement and military applications. In terms of photography, filters start close to visible light (with some odd color renditions) and progress from 665nm, 720nm and 830nm as the deepest filter usually available with practically no ambient color captured. 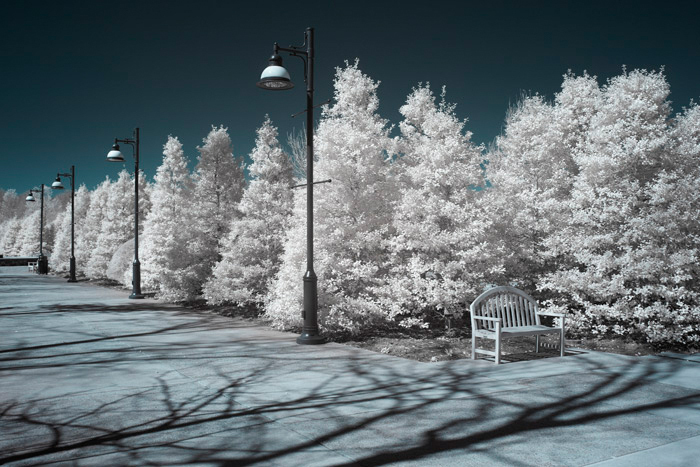 Traditionally, an infrared filter can be applied to an unmodified digital camera but it will result in average results due to the existing IR and UV filters already applied to digital sensors that will negate the capture of infrared wavelengths to some extent. In addition, and beyond the 6 or more stops of sensitivity losses, the camera must be fixed on a tripod and the scene framed before the application of the filter that will render the viewfinder useless due to its extreme density. The alternative resides in having a DSLR permanently modified by first removing the IR and UV filters already present in the sensor and subsequently attaching an infrared filter. This is a complex operation, relatively expensive, but one that can be reversed in the future with an additional investment. Due to the very delicate nature of this process only a few labs can successfully actuate this modification in a clean room environment. http://www.lifepixel.com/ is a reliable company that we have used on several occasions, offering many different filter wavelengths for a variety of results (many of which will quickly become a novelty and mundane after a short while). The drawbacks of a permanently modified IR DSLR are worth mentioning. 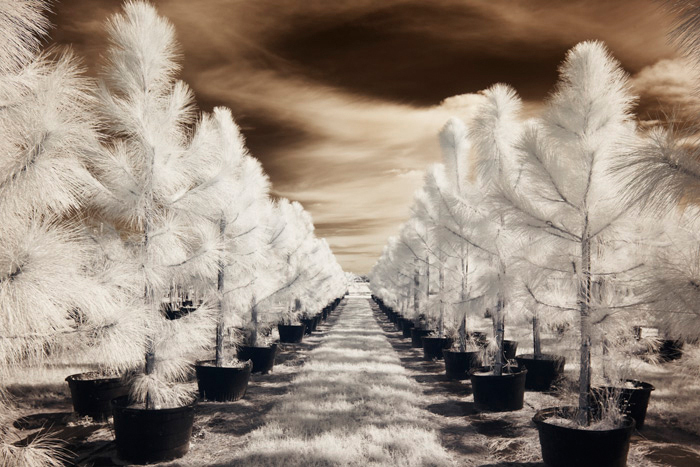 Besides the loss of sensitivity, roughly 6 stops of exposure and an increase in noise, the infrared wavelengths do not fall on the same plane as visible light. This necessitates the operator to manually adjust the focus very slightly clockwise (from the photographer’s point of view behind the camera). 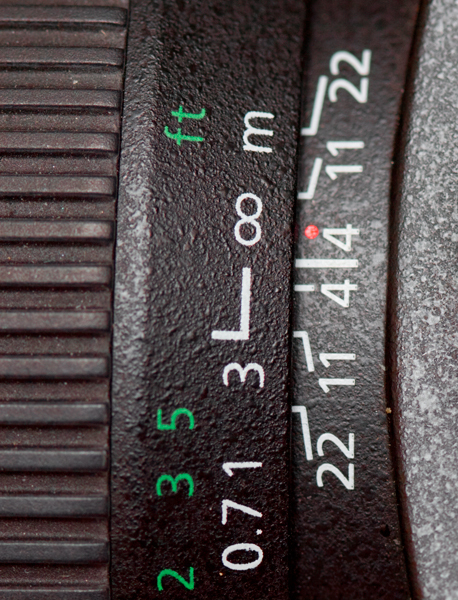 Many lenses have a small red dot as an indication of the shift in focus. Auto focus lenses are tricky to get the focus right and work better in manual focus mode. However, Lifepixel can adapt a specific auto focus lens to focus automatically for an IR image (at additional costs, including shipping), yet this is often a process fraught with uncertain results. Finally, some lenses will produce a hot spot in the center of the frame as a result of the internal coatings of the elements, with post processing as the only remedy. 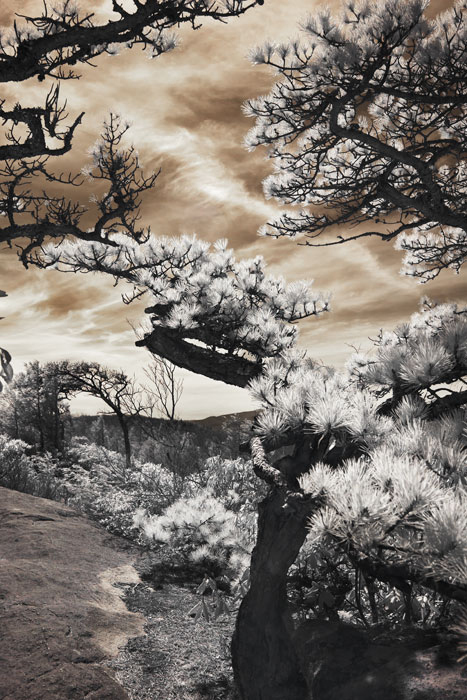 Ultimately, the choice of converting a camera into an infrared system must reside within a clear artistic concept, the pursuit of the unseen as part of the magic of the medium. If such a system is used for expressive and creative outcomes, the novelty will not wear off after a few weeks. Keeping to a 720nm or 830nm filters can also prove aesthetically valid, avoiding the weird and false colors of filters with a lower wavelength. Our current IR camera is based on a Canon 5D MKII modified with a 725nm filter made by Jenna Optik in Germany, a very thin filter that produces little noise overall. It is in constant use within many different genres, including self-portraiture. Our preferred lens for this custom system is a Canon TS-E (tilt shift) 24mm f3.5, manual focus that enables precise focus planes in addition to clear infrared images.